I finally made it to Spain! Barcelona in particular, and it was wild. I think what made this trip so unique was the synthesis of my Hockaday friends (Alison, Andrea and Skee again) and my Pitzer friend, Sonal, who is studying abroad in Seville. This was the first time anyone from home had met a Pitizen, so I can only imagine what my friends from home thought of us together—it had almost been a year since we saw each other last. Alison had a few friends from Paris there as well, from Hopkins. 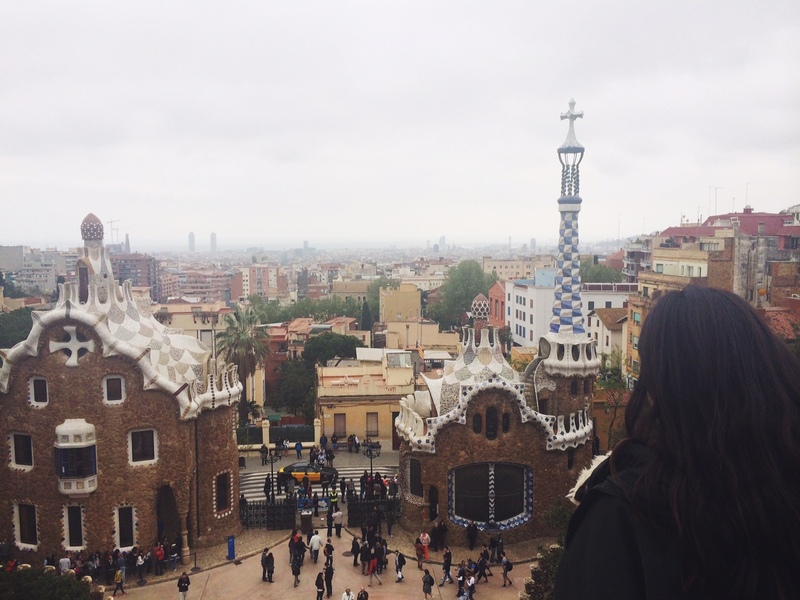 It was a unique mix but we all had a great time staying in an apartment in La Sagrada Familia, getting tapas, drinking sangria, and seeing a beautiful city. 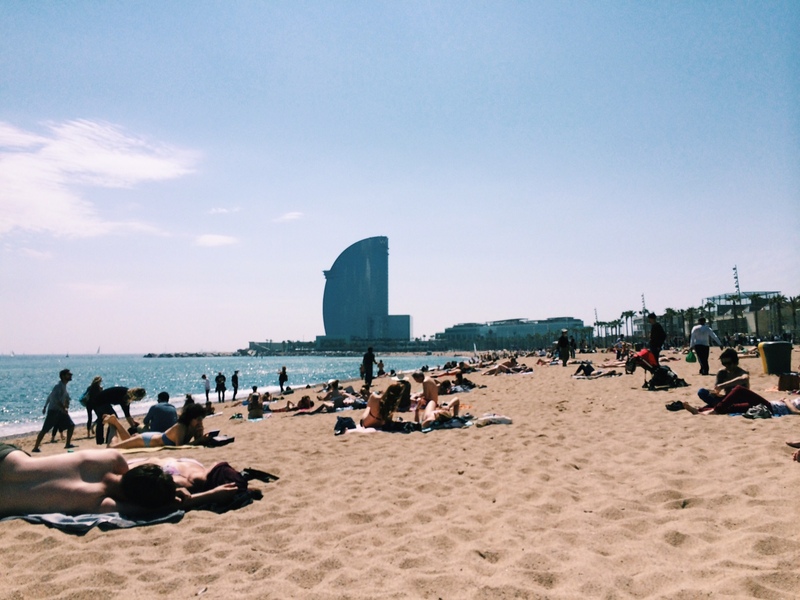 If Mexico and France had a baby, it would be Barcelona. That’s probably so politically incorrect, and I’ve never technically been to Mexico aside from hopping the border and peeing on the Mexico side (I blame GSES Classroom of the Earth for the encouragement) and I spent only one night in Paris a few years ago. However, from what I see of the cities and their architecture, it seems like it would make sense. 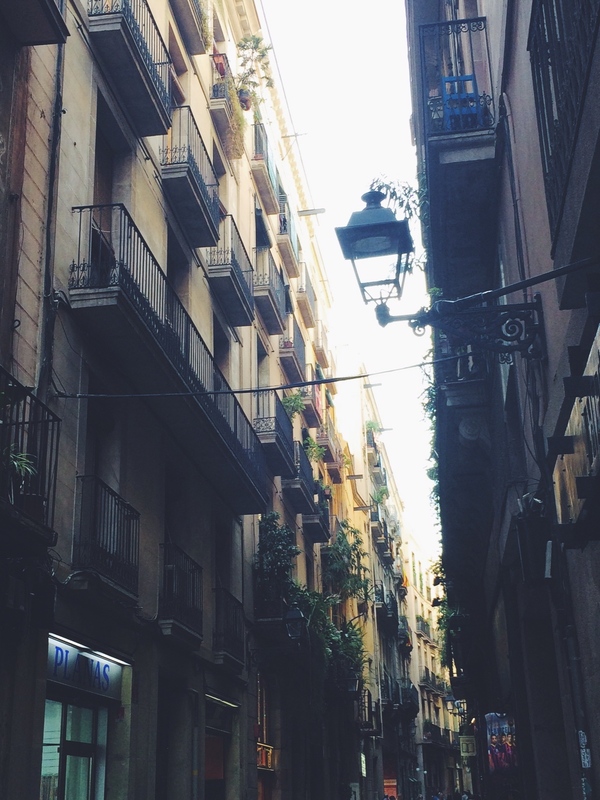 The city has this tropical/Mediterranean feel, but also a rich, established vibe. It was a great change of scenery (and climate!) from Amsterdam, so unlike some of the other cities I’ve been to, I felt very out of place in a great way. I think my favorite aspect of the city was the various green spaces and parks, even if they were small. 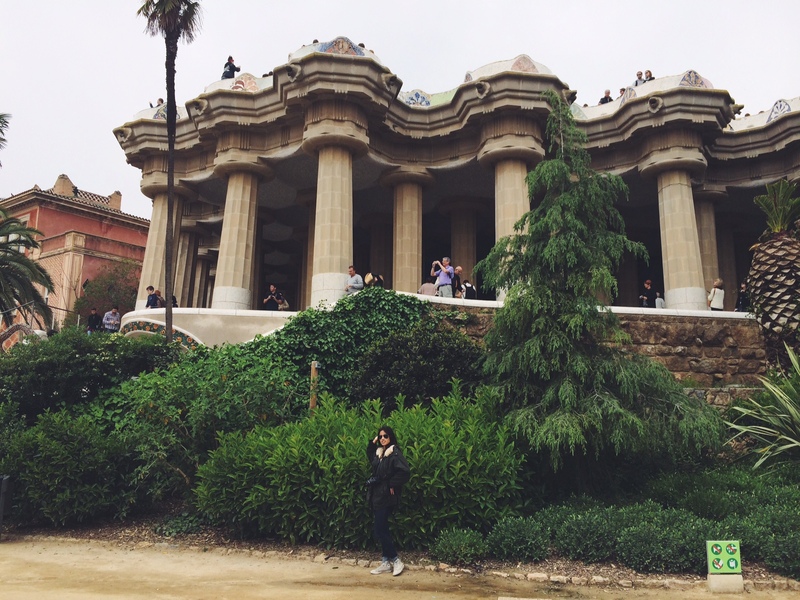 The structures and Gaudi architecture was unlike anything I had ever seen, but more on that later. We all arrived on Friday morning. We went out exploring and to find lunch, and we happened upon a restaurant called Mussol, which means “Little Owl.” How adorable! We got our first pitcher of sangria of the trip and enjoyed little salads and meat and cheese plates. 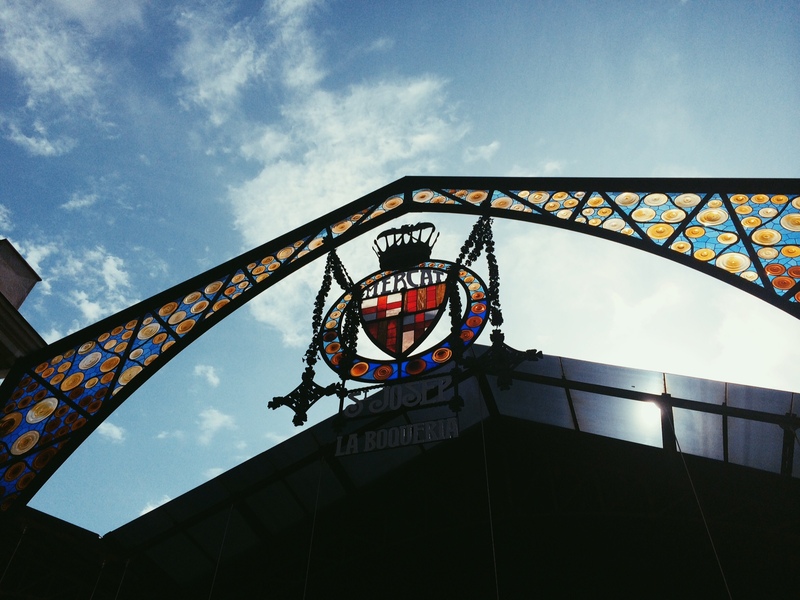 Afterwards we ventured to La Rambla, a shopping street with a great market, La Boqueria, attached. 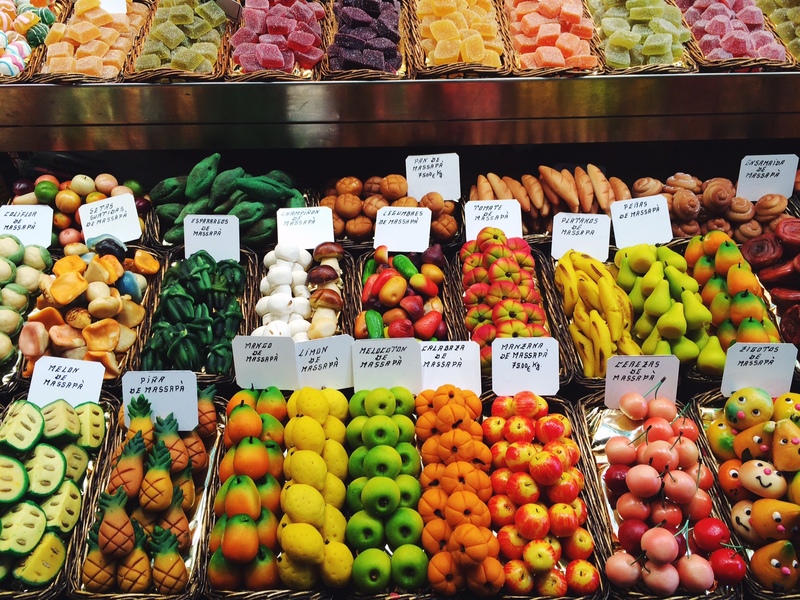 There were so many amazing sweets and fruits, lots of juices, and even some interesting meats and fish. We all got some chocolate, and Skee and I thought it would be great to get a super-sized truffle but they were five euros each and we didn’t know that initially; the woman wouldn’t let us put them back, so there’s that. At least it tasted good. 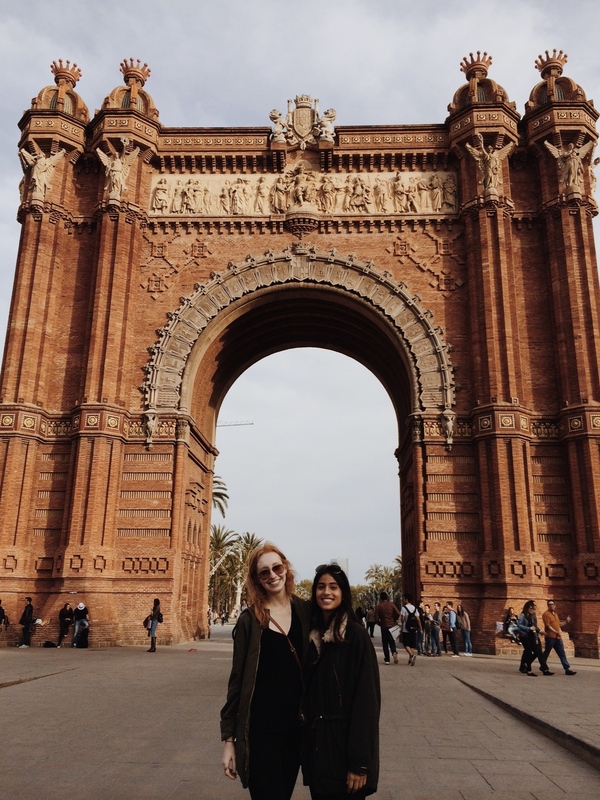 We kept on exploring, saw some beautiful streets, and then went to the Arc de Triomf. We grabbed some tapas for dinner and went home early because we knew Saturday would be a big day. I don’t know what I was expecting from tapas but I was a bit underwhelmed the two times we had them. Sangria, on the other hand, was all around always good. 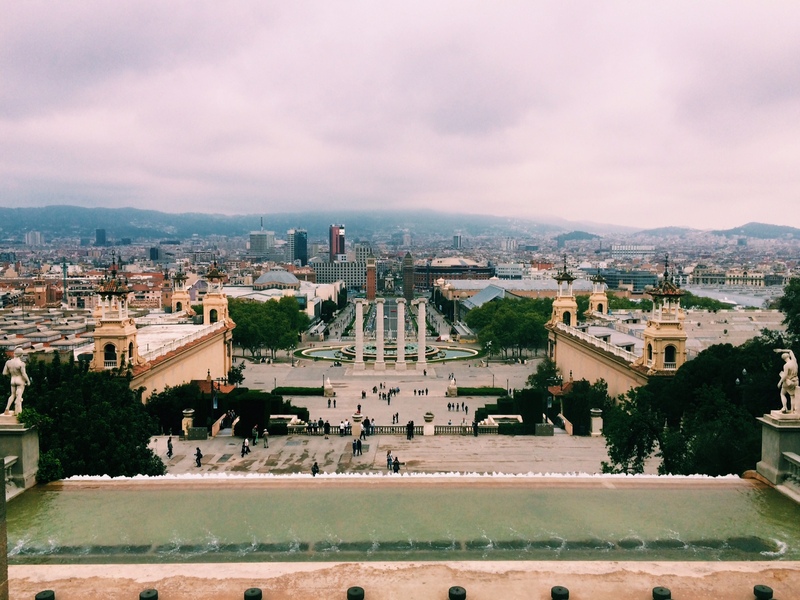 On Saturday, Sonal and I split from the pack to see the Museo Nacional d’Art De Catalunya instead of the inside of the big Sagrada Familia cathedral. I don’t think I regret this, because we ended up seeing a great photography exhibit of Joan Colom. He is a Catalan social photographer and got most of his shots from inside his jacket. 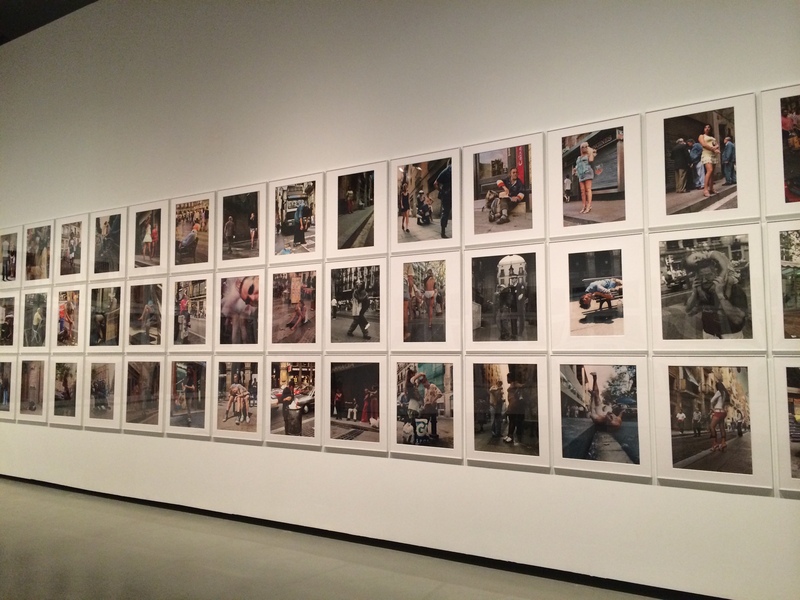 His main projects were on the Easter Processions (really freaky) and The Street, photographs of barrios in Spain. He was part of an artist group called, can you believe it, El Mussol (like the first restaurant we went to). The building itself and gardens around the museum were gigantic and beautiful. The day started out as overcast, but eventually we were greeted with the sun. After the museum, we took the hot and steamy (in a bad way) metro to Parc Guell, the gardens which house various Gaudi architecture pieces. We had to trek up a huge hill to get to the park entrance, then I guess Sonal and I went the wrong way and hiked through the outskirts of the park. Luckily, some of the hills had escalators. Ridiculous, but I was thankful. 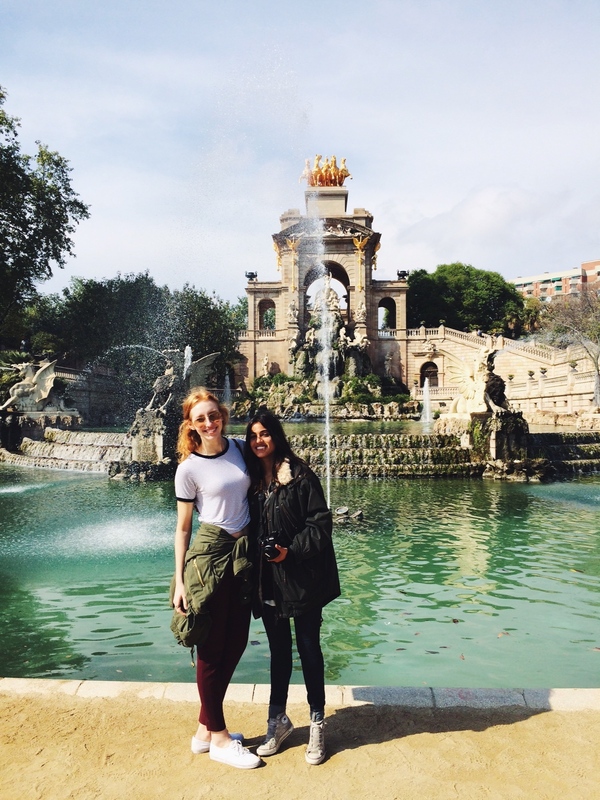 We met up with a Pitzer friend also studying abroad in Seville and her friend from home. 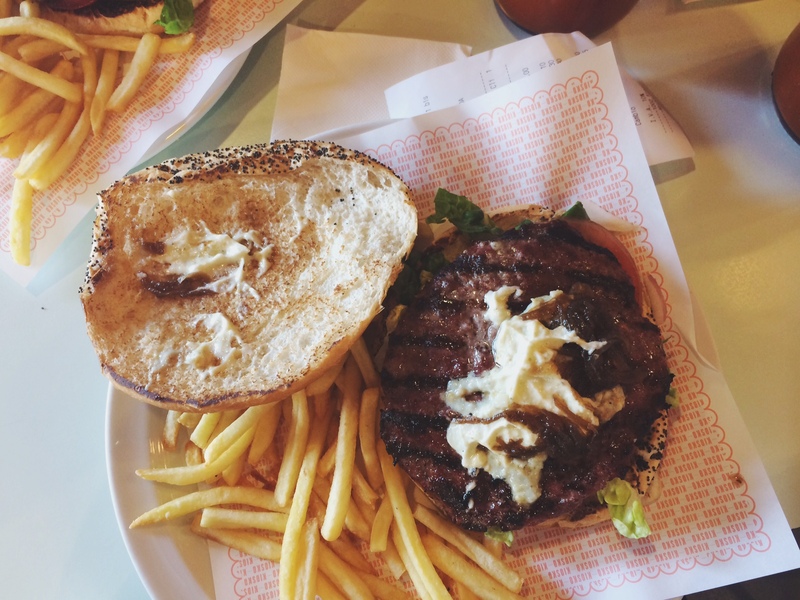 The four of us got the most amazing burgers at Kiosko, a gourmet burger bar with great prices and incredible burgers. The area where that restaurant was reminded me more of the West Village in Dallas, and I have deemed it my favorite area in Barcelona. Sonal and I spent the rest of the afternoon in Parc de la Cuitadella, a short walk from the restaurant. Sonal and me in the beautiful park! Unreal. That night, our last night, we had a big dinner of tapas and sangria (again, but also what else were we supposed to eat in Spain?) and headed for a bigger night out. We went to Pippermint, and bar suggested by a few different friends and known for giant pitchers of Sangria. Eight of us split 6 liters, which surprisingly ended up not being enough because more than half of the pitcher was ice! It was a rip-off but I guess just something that had to be done. Next, we trekked across the city to another bar, Dow Jones Bar, which is referencing exactly what you think. The drink prices go up and down, and sometimes the stock market crashes and drinks get pretty cheap. We were only there for a bit, because we had spent too much time crossing the city. Barcelona really isn’t all that walk-able, which took up a lot of time. I am an incredibly fast walker, however, and even if the girls got frustrated with me, I don’t have time to waste! Sunday was a day of relaxation around the city and on the beach. 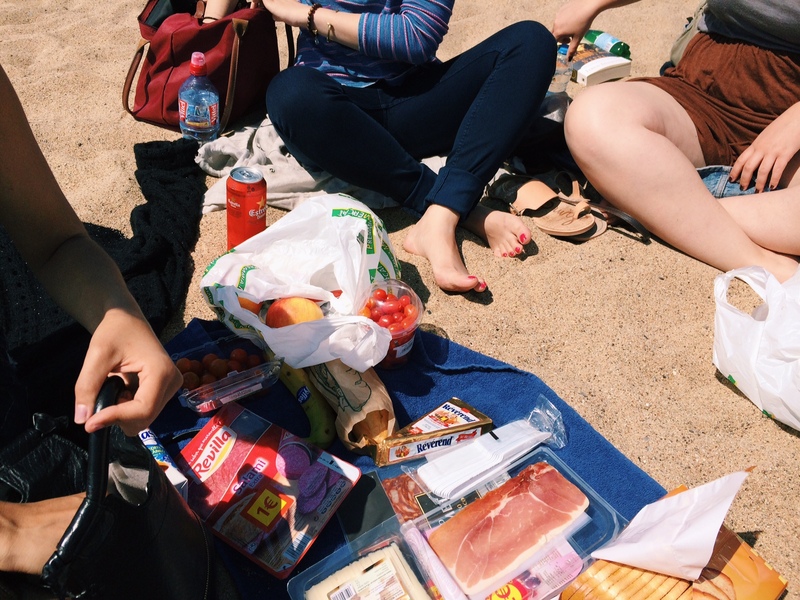 We went to Barceloneta and grabbed food for a picnic lunch. Alison, Andrea, Skee, and I are extremely successful picnic-ers. We just laid on the beach all day, enjoying the sun but avoiding the freezing water. 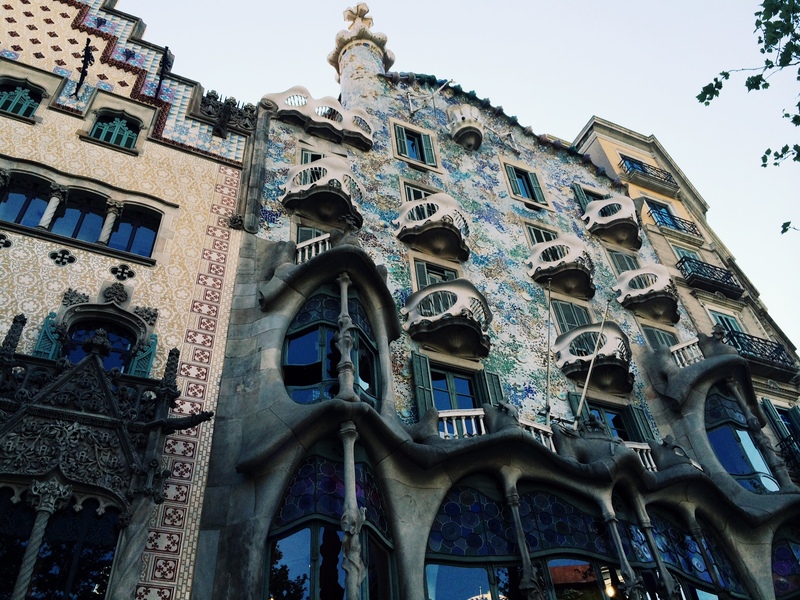 On our way home, we stopped by a few more Gaudi buildings. Sonal and I had to go back to the apartment to head to Amsterdam (yes, she came back with me!) but by the end of Sunday I was ready to be back home. This trip proved that a little more planning would have helped in terms of restaurants and transportation, but I think we did the best we could have given the fact that we were all busy in our respective cities before travelling. All in all I had a great time with friends, touched a new body of water (the Mediterranean), had some real sangria, and saw a new place that I wasn’t anticipating visiting. That amounts to a pretty great weekend. love the title of your post!